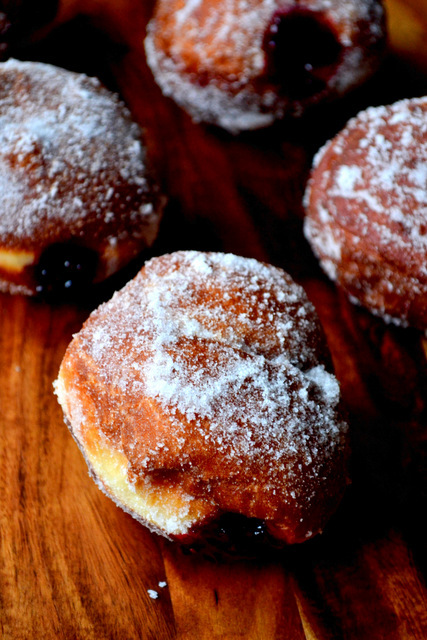 Growing up, I scarcely indulged in doughnuts; the idea of eating a deep-fat fried ball of – usually heavy and bland – enriched dough never truly getting my juices flowing. These days, good-quality doughnuts seem easier to stumble upon, but they can be expensive. Homemade Jam Doughnuts are a different matter entirely; light, fluffy and devastatingly delicious, there’s almost nothing better. And to cap it off? Homemade doughnuts are surprisingly simple and unabashedly frugal; providing, of course, you make your own jam. In truth – and in a similar way to my recent foray in Swiss Roll making – producing doughnuts at home has always seemed rather daunting. As with many things, worry needn’t have bothered straying into my mind; and neither should it yours. Whether you decide to make a batch of 6, 12 or more, the only difficulty lies in finding ample time to prove your dough. But what are weekends for if not bread? As a side note, if you are going to make more than 6, ensure there are hungry mouths on hand for speedy consumption; the freshness of doughnuts hangs around for no man (or woman). When it comes to the filling, the flavour of jam you use is entirely up to you and will likely depend on the season. At the time of baking my fridge was still well-stocked with blackberry and basil jam, which worked incredibly well. Just make sure to use a piping nozzle that’s large enough to effectively convey your jam to its destination; on more than one occasion my blackberries got rather wedged in. Don’t hold back on the filling either; you want every bite to contain at least a little. Doughnuts aren’t healthy, there’s no getting away from that fact. Sorry. But if you’d rather not deep fry, then consider my recipe for Cinnamon Dipped Doughnuts, a baked treat with my oil in sight. Put the flour, yeast, salt and sugar in a large bowl and combine. Gently warm the milk and water, tip into a measuring jug and add the butter, allowing it to melt. Add the wet ingredients, along with the beaten egg, to the dry and bring together into a firm but malleable dough. Gently flour a surface and turn the dough out. Knead for 10 minutes, form into a ball and pop into a clean and lightly oiled bowl. Cover with a tea towel and leave in a warm place to prove for an hour. Once proved, turn back out onto your surface and knock back. 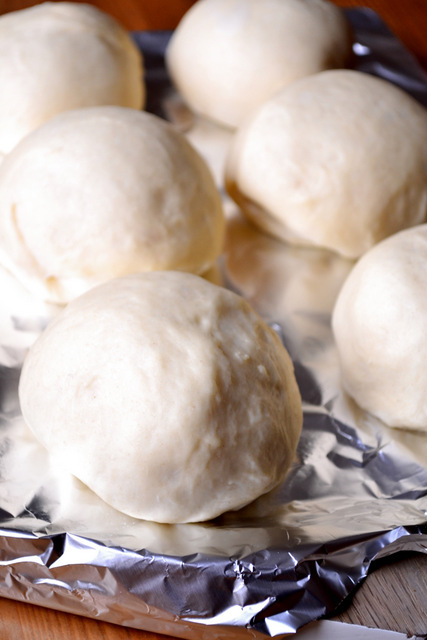 Split and form the dough into 6 equally sized balls. Transfer the balls to a large, non-stick chopped board, leaving enough space that they won’t stray onto one another. Leave them in a warm space for 45 minutes, or until doubled in size. When the dough is ready begin heating a litre of sunflower oil in a wok, or similar pan. Once the oil had reached 180C begin to fry the doughnuts, giving them 2-3 minutes on each side. When golden brown and cooked through allow the doughnuts to drain onto kitchen cloth before coating with sugar. Leave to cool for 5 minutes. 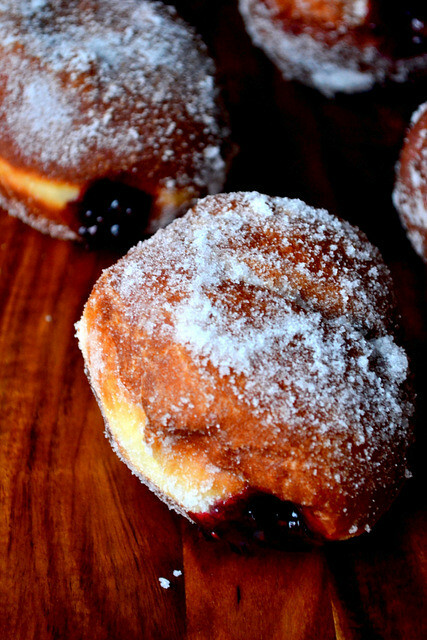 Fill a piping bag with the jam and poke a hole deep into each doughnut. Fill the doughnuts with equal amounts of jam and try to eat when still warm. Cost: The only expense when it comes to doughnuts is the filling; and if you make your own then even that disappears. I’ll not take the full cost of oil into consideration because it can easily be re-used and certainly should be! All told this batch of delicious doughnuts should set you back no more than £1.80, if using your own jam. 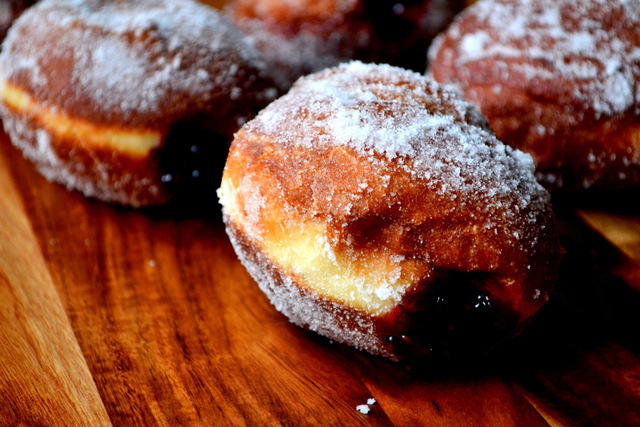 I would never have thought of making my own jam doughnuts until I read your post. 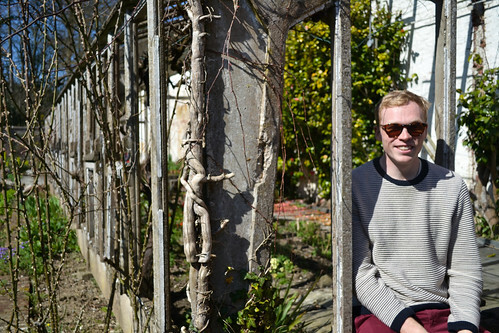 They look so good – and do-able! Very simple – incredibly so. Just need to get the oil right is all. I think the light on those doughnuts is just fine. They look fantastic and I can only beg for you to make some more one day ! They’re not too bad in moderation! When I made homemade doughnuts, the whole time I kept thinking to myself, “You’re crazy, no one needs this many doughnuts!” But they were SO SO worth it. I like the proportions of this more petite recipe! I gave mine away, but yes it’s nice to have a small recipe I have no need of 20 doughnuts. I wholeheartedly believe the weekends are for baking and gluttony – here’s to that. Oh me too – I’m a glutton every weekend. Wow, these look so tempting! I want one. Now! I’ll confess though, that I’ve never made a doughnut, even though I’ve eaten more than a few. I don’t think any of them looked this good, though. Oh you should try them – very simple indeed! They do and are… I’ve not made them again, too tempting! I’ve never been particularly keen on doughnuts but my husband loves them and although I haven’t ever made any yet, it’s a challenge I’d love to try one day. These look gorgeous. Thank you – please try then, they were lovely and very easy.